While working from home has many advantages – no commute, better work-life balance, the flexibility of setting your own schedule – it also presents plenty of distractions, some of which end up sapping your daily productivity and, ultimately, your career. For far too many home workers, what should be a happy and inspiring environment rapidly turns into one that makes them sore and exhausted by the end of the day. Aside from accomplishing very little, they have less time and energy for themselves and their family, which further prevents them from focusing on their work –thus completing the vicious cycle. The good news is, setting up a professional working space at home for your new business is actually fairly easy. Here are some simple rules to ensure your home office doesn’t only make you productive, but happy, as well. The obvious thing to do first is choose a place for your office that’s comfortable enough and has as few distractions as possible. 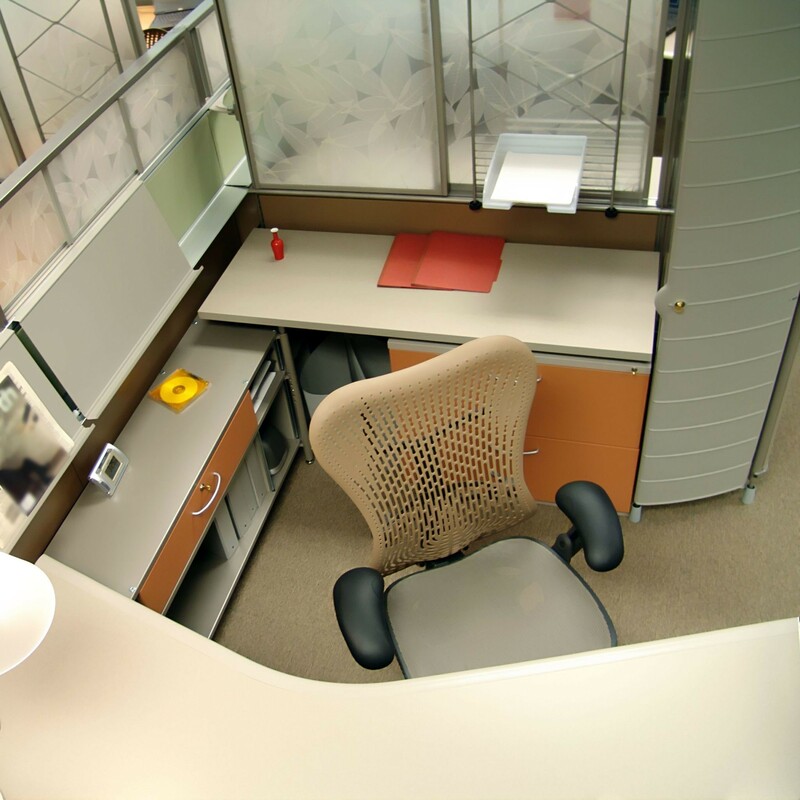 However, before claiming a room in your home and start calling it your office, assess your space requirements in relation to your business needs. For instance, if you work as an accountant, you may need additional space for file storage; working as a freelance writer, on the other hand, may only require a small desk to fit your laptop computer and stationery. Make a list of your business needs and think of all the possible ways you plan to use your home office prior to designating a place for it. It’s also very important to be realistic about your needs and possibilities. It’s OK to browse Pinterest and design magazines for inspiration, but take into consideration that, while some of the fancied-up pieces of furniture may make your office look awesome, they might not accommodate your real needs. Therefore, compile a list of your work duties and get practical: an effective home office is functional first and aesthetically-pleasing second. No matter if you work from home or in a traditional office space, you need to be able to interact with your environment efficiently and, most importantly, in a safe manner. If you’re setting up a home office for your startup, you probably have some degree of budgetary constraint and may be tempted to skimp on equipment, thinking you can make do with the furniture you already have. Please don’t. A comfortable, adjustable swivel chair and a good desk are among the essential investments you’re going to make when you bring your work inside your home – and the secret factor in your productivity. When shopping for an anatomically-correct office chair, make sure it includes these features: firm lumbar support, adjustable seat height, width, and depth, adjustable backrest and armrest height, appropriate seat material, and swivel rotation. Also, learn how to adjust the rest of the components of your workstation, including the monitor and keyboard, for support and comfort. A common issue with working from home is that you may end up having files everywhere. While a paperless office is a nice dream, you probably need plenty of storage space to keep important documents and stationery out of sight. And don’t automatically assume that you’re going to ruin the feng shui of your office by adding some drab utilitarian file cabinets. The storage solutions available these days are both smart and good-looking, and they will ultimately give the room a professional feel. If wall space is scarce, think about going vertical with your storage needs. For instance, you can acquire a tall shelving unit that will keep your files, papers, and books properly organized. If you need a bookcase, get one that’s large enough to accommodate all your stuff and well-designed enough to reflect the professional atmosphere in your office during client meetings. You can definitely add some flair to your office corner and make the space more pleasant by adding some personal items. A couple of family photographs, some nice artwork, a memo board, and one or two plants are perfect to give you a sense of wellness during office hours. 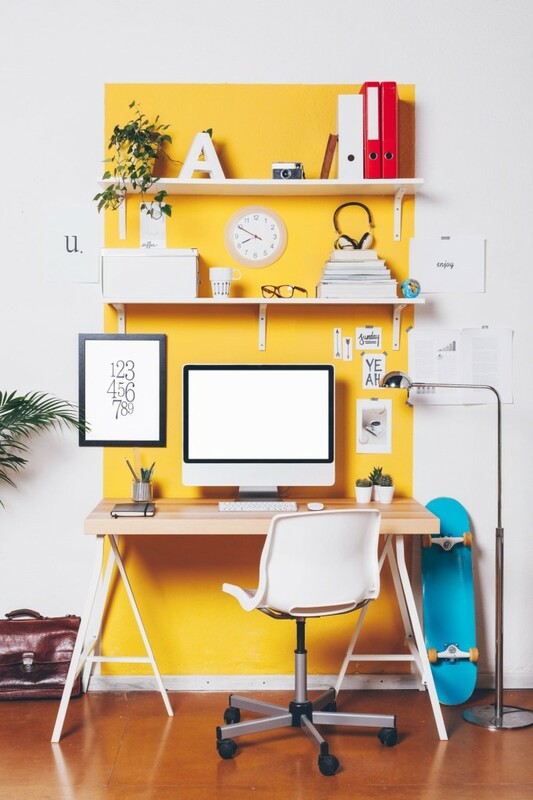 If you have the liberty to decorate your new office space as you please, consider changing the color of the walls into something stimulating: try yellow for improved focus, blue for greater productivity, or green for calm and relaxation. It’s essential, however, to not exaggerate with environmental stimulation, because it can rapidly turn into a form of distraction itself. Although you are at home and can decide where and how to work, health and safety requirements are just as important as in any traditional office setting. As far as lighting is concerned, it’s wise to not set up your desk in strong sunlight, but also not in the darkest corner of the room. You want to have plenty of natural light, so it’s a good idea to move your desk close to the windows, but try to position it parallel to the panes in order to create balanced lighting that minimizes glare and eye strain. This provides a good foundation for a well-lit working surface that can ultimately be enhanced with suitable artificial lighting. 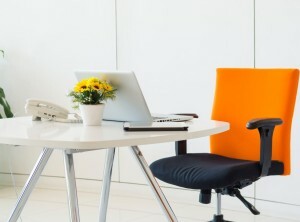 Since the quality of indoor air is directly connected with mood and productivity, make sure your office space has proper ventilation to allow as few unpleasant odors as possible inside. You may not necessarily feel it, but all your furniture, carpets, and varnishes have certain emissions, some of which can negatively impact your health. Setting up a serene, well-organized, and efficient home office is simpler than you think and definitely worth the time and effort. Get the help of a professional home office space planner to help you create a space that supports both your workflow and your sense of style for maximum productivity and comfort.